Inflation disproportionately affects specific groups of people, with families paying college tuition among those who have been hit the hardest. Inflation has been tame in recent months. However, the one thing we can be certain about is this: Increases in inflation will have a painful effect on lower income households, those on fixed incomes, those with higher ratios of transportation costs, college tuition and any household whose discretionary spending is more dream than reality. As explained by Doug Short, with its recent quantitative easing “the Fed has been trying to increase inflation, operating at the macro level”. Here are his comments on inflation in the higher education sector. Public four-year colleges charge, on average, $8,240 per year in tuition and fees for in-state students. Public four-year colleges charge, on average, $20,770 per year in tuition and fees for out-of-state students. Other factors in play are slowing down the skyrocketing costs of college, so the worst of the “inflation nightmare” may be over for a while. ‘Eds and Meds’ – Are soaring costs tied to third-party payments? 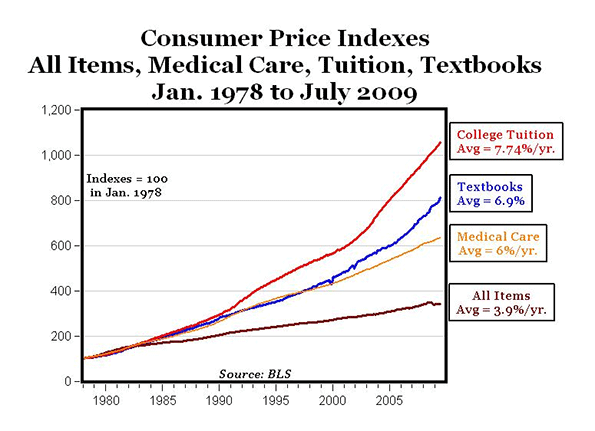 Higher education and healthcare (Eds and Meds) are two areas of our economy that share a recent history of soaring costs outpacing inflation. Another common feature of these two sectors is a high reliance on other people’s money. Both sectors have consistently been creating new jobs. As reported by Derek Thompson in The Atlantic, healthcare and education are the only major job sectors that have experienced net positive growth during the last five years, a period that started two years before the “Great Recession Trough”. These soaring costs cannot be sustained. If the health care cost crisis has long been known, the public is just waking up to the crisis in higher education costs. Skyrocketing tuition has driven the cost of many colleges through the roof. This traditionally didn’t bother students, who were assured that a college education the key to a good job that would easily allow loans to be repaid. In a global age where even knowledge economy jobs are subject to offshore competition, and a recession that’s kept many young people — including many now deeply in debt — unemployed or underemployed. There is now about $1 trillion of it outstanding, much of it non-dischargeable in bankruptcy…. William Henderson, Indiana University law professor writing in The Legal Whiteboard, sees an opportunity for productivity gains. There is an opportunity here. I would be extremely bullish on innovations that produce productivity gains in the Eds and Meds sectors. I recently listened to this HBR Ideocast discussion with Robert Kaplan, the Harvard Business School professor best know for developing the Balanced Scorecard. Kaplan is now turning his considerable intellect toward the problem of cost-containment in healthcare. What the key insight? Measuring how much patient treatment actually costs–to date, there has been almost no sophisticated cost accounting in healthcare. Most of the brainpower has gone to dealing with (and maximizing) third party reimbursements. Under Kaplan’s system, fortunately, we can actually identify the points in the system that cost way too much and thus begin the reengineering process. The same thing may soon be happening in higher ed. Another Harvard Business School professor, Clayton Christiansen, who authored the renowned business book, The Innovator’s Dilemma, recently co-authored a letter that called for colleges and universities to quit chasing prestige and start focusing on innovations that improve educational quality without increasing price. Remarkably, the letter was included in a mass mailing by the American Council of Trustees and Alumni — going to 13,000 trustees! See Inside Higher Ed, Distruption’s Strange Bedfellow, July 12, 2102. Another Insider Higher Ed story suggests that this may be the true faultline driving the University of Virginia controversy. See Disruptive Innovation: Rhetoric or Reality?, June 26, 2012. The world appears to be changing, even in Eds and Meds sector. Michael J. Petrilli lays out the options for choosing between healthcare or education spending. The choices are easier if economic growth is robust. You can either “ration” health care or you can “ration” education (and all other social spending). Take your pick. According to a July 19-22 USA Today/Gallup poll, 69% of Americans believe ‘making college education affordable and available’ is extremely/very important for next president. There should have been a follow-up question asking exactly how the president should accomplish this. Improving the nation’s public schools, considered important by 83% of respondents, would probably help make college available to more students, but I’m doubtful there’s very much the president can do in that regard. Making college education “affordable and available” was viewed as “extremely important” by 38% of Obama supporters and by 22% of Romney supporters. Should we go back to more vocational high school options? Nancy Hoffman argues that high school vocational programs should not be viewed as the “default for failing students”, but as a smart alternative to the college-for-all mentality that has become pervasive in the United States. In her book, Schooling in the Workplace, she looks at lessons to be learned from the educational programs in six countries – Australia, France, Germany, the Netherlands, Norway, and Switzerland. While acknowledging that not everyone is cut out to “debate the big ideas in literature and in politics”, Hoffman conversely maintains that “we need a much stronger set of academic demands up to age 16”. Amen to that! Since we now seem to have few students able either to intelligently debate the big ideas or write a coherent paragraph, our system might be failing us on both counts. The least we should aim for is a higher percentage of citizens who are self-supporting and able to participate fully in our democracy. Perpetuating class and racial divisions? One stumbling block to reinvigorating the high school vocational track is the criticism that doing so perpetuates class divisions, promoting vocational education as an option only for working class or minority children. Hoffman responds by pointing to the European experience and expressing a pragmatic assessment of our present situation. … Income inequality is much greater in the United States than in European countries. There is much greater mobility in the European countries than here. Secondly, my view is that I would much rather have a 3 percent youth unemployment rate and most young people having a job, than have the bifurcated system we have in the United States, [in which some kids go to four-year college, and the rest face a 22 percent unemployment rate]. I’m not sure about Hoffman’s claim that income mobility is higher in Europe than here, but in any case I am more interested in her argument that we should be looking at policy ideas that have a realistic chance of improving our dire unemployment problem. I just don’t think we can afford to waste time with romantic ideas about how everyone one of us should aspire to get a bachelor’s degree. I am the product of a vocational high school education. In my last two years of high school, I participated in DECA (previously known as Distributive Education Clubs of America). The program has morphed into something slightly different, but back then it was a way for a high school students to spend part of the day in the classroom while working at a paid job in the afternoon. We received classroom instruction in various job skills and took part in competitions against other schools. There were various reasons why I ended up in DECA instead of in a traditional college prep track, but mainly it was for the money. As it turned out I did attend college right after high school graduation, but was handicapped by gaps in my high school education. It was only through my perseverance and aptitude that I managed to get my college degree in a STEM field. Vocational high school could be a better option for many different types of students. While it might be dangerous to extrapolate from my experience, I can see how disadvantaged and/or academically weak students could benefit from choosing a high school vocational education. Several possible outcomes are likely for these students. One is that they would start working right after graduation at a job that pays a living wage, enabled by training and experience gained in high school. That could be followed later by postsecondary training, either vocational or traditional college. Or they might go on to higher education directly after high school, although perhaps only strongly motivated students would opt for the traditional four-year college experience. In any case, vocational high school could be a better option for different types of high school students. Amid evidence that most of the fastest growing jobs in this country will not require a college degree, this comment helps make the case for vocational high schools. This country needs carpenters, electricians, auto mechanics, computer techs and all sorts of other workers, none of whom need a college education to do their job. The last thing this country needs is another unemployed marketing or communications major! “There are 80,000 bartenders in the United States with bachelor’s degrees,” Vedder said. 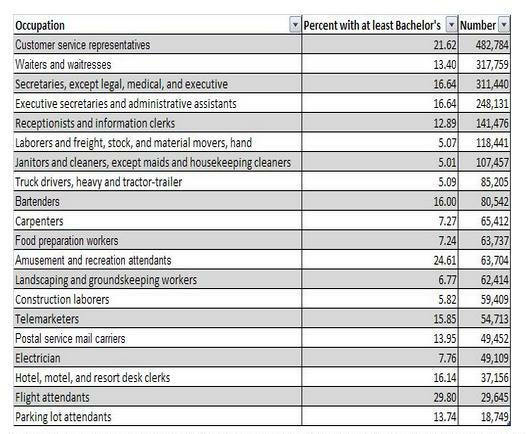 He says that 17 percent of baggage porters and bellhops have a college degree, 15 percent of taxi and limo drivers. It’s hard to pay off student loans with jobs like those. These days, many students graduate with big debts. Richard Vedder and others argue that it’s not always the college education that causes college graduates to have higher lifetime earnings than non-graduates. Rather, it’s that people who go to college are more disciplined and smarter than those who don’t. More background here: Why Did 17 Million Students Go to College?